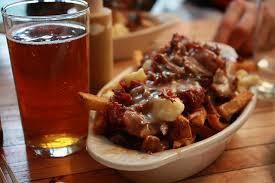 Craft Beer Pairings for Poutine. Bon Appetit! Right up there with key lime pie, cilantro, and olives, poutine is a “you either love it or hate it” kind of dish. Most people, however, seem to fall squarely on the “love it” side of this plate of crispy, hot French fries topped with beef gravy and fresh cheese curds. And while a plate of poutine usually comes after a night of drinking, a cold beer also makes a fine accompaniment alongside it, so here are six craft beers to pair with your poutine. Bon appétit! Quebec is the homeland of poutine, and its strong, malty Belgian ales and hearty stouts can get on the same level as the rich, hearty poutine. Dieu du Ciel’s Péché Mortel, an imperial stout brewed with coffee, is a luxurious, creamy indulgence, and at 9.5 percent ABV, it’s a perfect slow sipper in between bites.